The New Southern is an arena for unity and connection — a safe place to champion and support others while also cultivating curiosity and creative prosperity. When I first came across the talented Chambers Austelle's work a few years ago, I was shooting for a dear friend and client Lindsay Rhodes. There was a strong stoic woman staring at me from the wall and I was immediately captivated. Her worked stopped me in my tracks and made me think beyond the confined expression while I absorbed her vibrant playful color choices. There is meaning between this visual dichotomy and I love how Chamber's continues to explore the evolutionary role women have within our society and our role with beauty. I recently am the proud owner of almost a 6ft by 6ft piece (I am shooting this beauty soon).... I walk by her every morning when I am headed out the door and I can't help to feel liberated and a sense of connection.... a connection with Chambers's work and a connection to the strong women before us who endured so much to make our generation a more freeing and loving place. While we are all pursuing our own dreams and enduring our own hardships, I encourage us to be reminded that we have the power to leave our communities a more loving and light-filled place for the next generation of strong men and women. I am deeply grateful for Chamber's gift and I hope her work inspires you all to do beautiful and thought-provoking things this week! 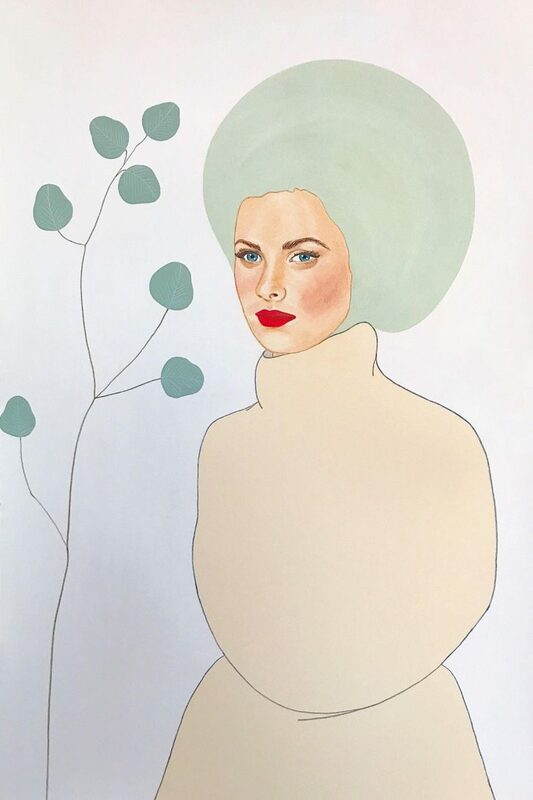 I am excited to introduce to you this Charleston based contemporary artist, Chambers Austelle, who greatly contributes curiosity and passion through her art. A highly creative child that found her calling in college...She believes in doing what makes you happy, living life in the south while using her art to question the perception of women. As a female professional with a desire to champion other powerful women who are paving their own way, I admire that Chambers is so deeply inspired by our role in society along with a curiosity with our relationship to beauty. Featured in Charlie Magazine’s “50 Most Progressive” and a variety of national publications — her work has been exhibited on both the east and west coasts and belongs to many private collections, as well. Using saturated, vivid colors to establish a feeling that matches that of fashion photography. The bright backgrounds against white dresses, behind elegant faces are bold and thought-provoking. The colorful and enlightened artwork feels just as funky as it does nostalgic and inspirational. Chambers Austelle: I’m an artist living and working in Charleston, SC with my husband and three dogs. I’ve always been extremely creative. As a child, I could either be found up in a tree, or inside destroying my room with paint, glitter, and any other material I could find. I originally wanted to be a psychiatrist, but switched my major to studio art in college. I don’t think I was necessarily making the decision right then and there to be an artist, I just knew I didn’t want the lifestyle of a medical student. I now work from my home studio — using primarily acrylic paints, pastels, and ink. I’m slightly obsessed with travelling, French food, naps and, well obviously, dogs. CA: In my work I am exploring the way in which our society views women and their relation to beauty. 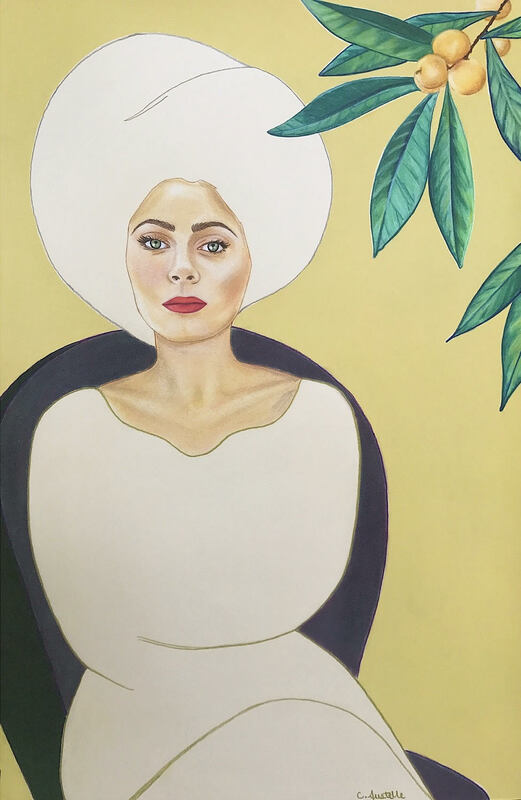 I place idealized women in isolated settings saturated with bright colors, challenging the viewer to confront the dichotomy between the perception of liberation and that of confinement. 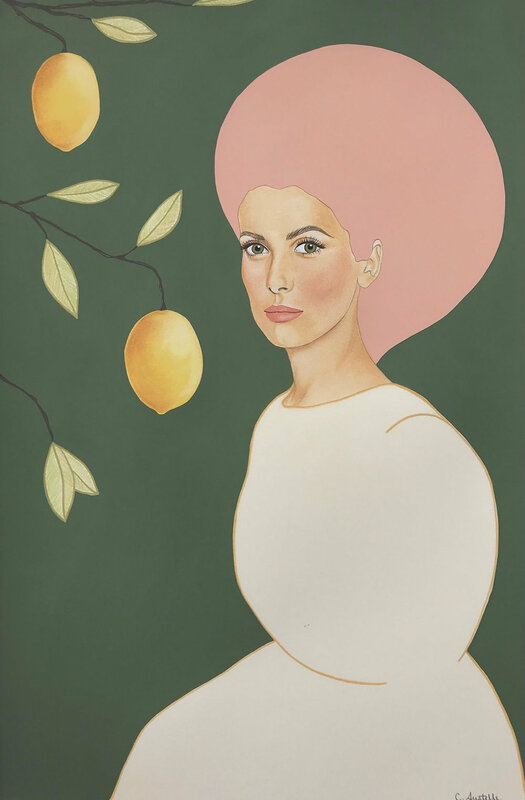 Now alongside these classical portraits of women (and family members), we have these contemporary portraits of women in our homes that ignite and encourage a conversation about our roles in society and continued plights. CA: Living in Charleston, I am completely spoiled. The Dewberry is one of my favorite spots. They have this wonderful mid-century modern meets southern chic style designed so purposefully. Nothing is overdone and everything works together so well. CA: Fritz Porter, JLV Creative, and Workstead. CA: For a cool white, Chantilly Lace by Benjamin Moore, and for a warm white, Whisper by Dunn-Edwards. For black, it’s Black Beauty by Benjamin Moore. CA: Do what makes you happy. AR: The key to making a house a home? CA: Function and personality. Your home is your space, and it should reflect you. Don’t be scared to personalize it. I’m also a huge believer in purpose. Make sure you know what the function and purpose of the space is, and then design accordingly. CA: Have faith in yourself. My mother always instilled the belief in me that I could do anything I wanted to. Most of the time what’s stopping you from doing something is the belief that you can’t. CA: Research! Research creatives and businesses you love, read a million articles, reach out to people in your community and network. Also remember to be patient and give yourself a break! CA: Sophie Treppendahl – I love how painterly she is and how she can make any subject matter interesting. Freckled Pottery – I have always loved pottery and her vases and mugs are just the best. They are so simply and her color choices pair perfectly with the freckled glazes. Jane Pope Jewelry – Jane makes to most beautiful custom rings. She is definitely on the top of my wish list. CA: Do it! If you’re having trouble knowing where to start, I’d suggest adding a few modern accessories, like lighting fixtures and rugs, to vintage/antique furniture. CA: Plant, candle, or original art (or all three if I really love you). CA: New Nordic Design. My brother brought it back for me from one of his Europe trips, so it wins by sentimental default.